The 5th annual Uncle Sam Jam has become part of the Downriver Communities’ Independence Day Holiday Celebration. This event is held Thursday, July 10 through Sunday, July 13th and will take place in Civic Center Park in the City of Woodhaven, near 1-75 and West Rd. The Uncle Sam Jam brings family fun to Woodhaven with Friday night fireworks at 10pm, carnival rides and games, interactive displays and attractions, petting zoo and camel rides and FREE concerts all weekend long! 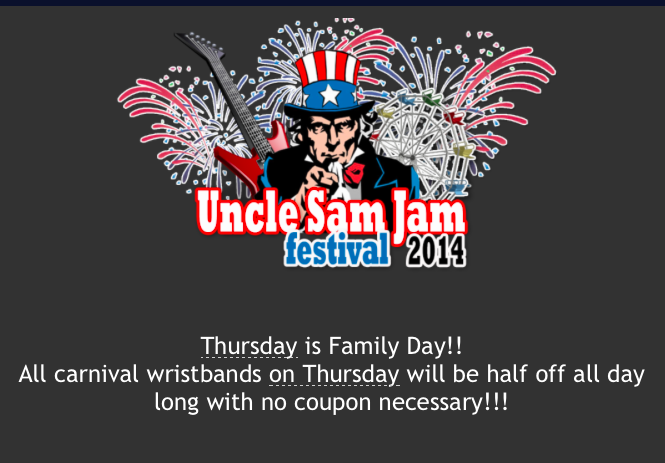 The Uncal Sam Jam Carnival will open from 2-11PM on Thursday and all wristbands are half off! The carnival will feature over 30 rides including a water slide and coaster. There will also be rides all ages can enjoy and any thrill level you are. No coupon is needed to get the half off carnival ride wristbands. Bring your family and interact with some of your favorite farm animals. This year’s Uncle Sam Jam will feature Whispering Pines Mobile Zoo. It is Michigan’s largest mobile animal exhibit and has varieties of animals from around the world.The petting zoo is for all ages to enjoy and will surely be memorable and exciting. Come check out Downriver’s biggest and best fireworks show on Friday, July 11 at 10:00pm at the Uncle Sam Jam in Woodhaven, Michigan. This awesome show has quickly become a family tradition in Southern Wayne County and will continue to be for generations to come. This spectacular show begins at dusk and can be seen anywhere inside the festival grounds.